Adolph Gysbert “Sailor” Malan, DSO & BAR, DFC & Bar was a South African pilot in RAF Fighter Command during WW2. During the Battle of Britain he led No. 74 Squadron. His final war tally of ‘victories’ was 27 ‘Kills’, 7 ‘shared’, 3 ‘ probables’ and 16 ‘damaged’. Our figure shows him as a Squadron Leader during the Battle of Britain.. He left the RAF in 1946 as a Group Commander. Douglas Robert Steuart Bader, lost his legs in a flying accident in 1931 and was invalided out of the RAF in 1933. With the outbreak of WW2 in 1939 he managed to rejoin the Air Force and by June 1940 was made Squadron Leader of No. 242 Squadron. In August 1941 he bailed out over France and spent the rest of the war in various prisoner-of-war camps including the infamous ‘Colditz’. His wartime record included 22 kills’, 4 ‘shared’, 6 ’probables’ and 11 ‘damaged’. Among his awards were the DSO & Bar, DFC & Bar and ... a later knighthood. 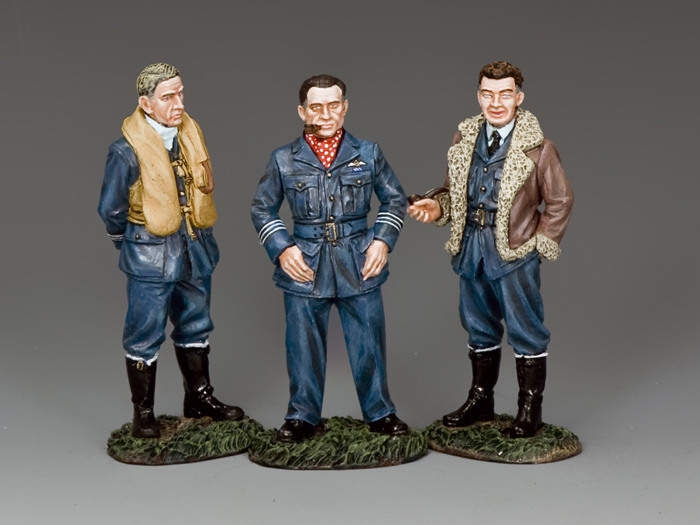 The K&C figure portrays him as a Squadron Leader in mid 1940. 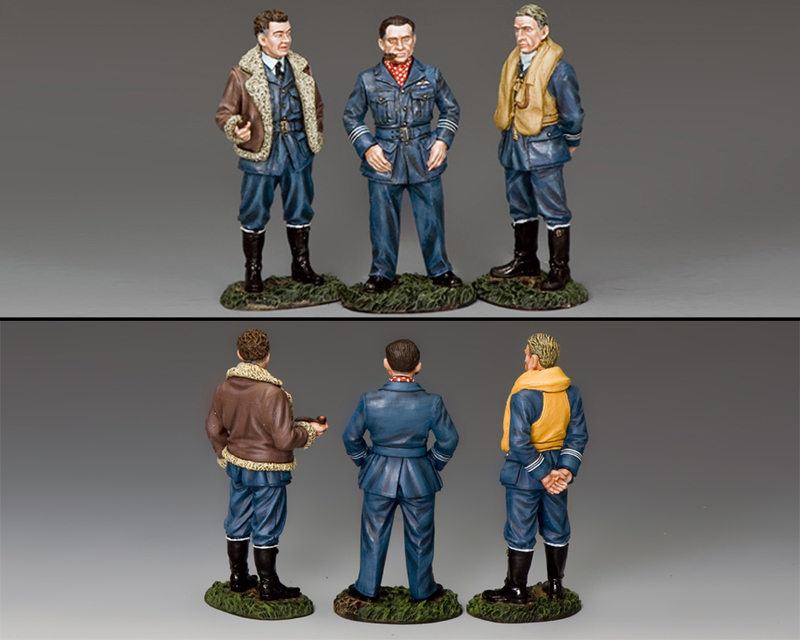 Our final RAF figure is Alan Christopher Deere, known to his friends as ‘Al’. This New Zealand-born pilot joined the RAF in 1937 and flew during the Battle of France ... the evacuation of Dunkirk and the Battle of Britain. In 1942 he took command of No. 403 Squadron, Royal Canadian Air Force and swiftly established himself as a ‘born leader’. Unlike both Malan and Bader he remained in the RAF after WW2 eventually becoming an Air Commodore. His personal awards included the DSO, DFC & Bar and the French Croix de Guerre. His wartime tally of victories ... 22 ‘kills’, 10 ‘probables’ and 18 ‘damaged’ ‘Al’ Deere passed away in 1995 and, fittingly, his ashes were scattered over the River Thames from a Spitfire!